Here is shark craft #1 out of 2. 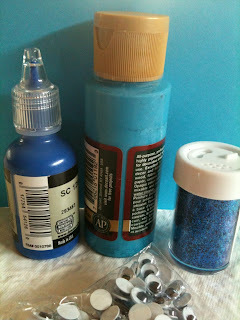 I searched Google Images for shark crafts and found two that were easy, cute and I already had the supplies on hand. Yes, I know sharks are gray, but, would you believe I didn't have gray in my paint supply. Crazy! And yes I know, I could of mixed white and black to get gray, but, I wasn't thinking straight obviously. The craft was really easy. Take some clothespins and paint them. Cut out fins (we used cardstock & added some sparkle) and glue on and add a googly eye and you are done. Don't forget the teeth too.